Hi Connie here with you today to share a winter scene. My daughter gave me some of the Spectrum noir sparkle markers for Christmas and when I saw this blue I knew I had to try a night time winter scene. I first started by only coloring the part of the sky that I needed on my background, only use papers and whatever product for your background that you will have showing, I think it helps to adhere the next layer easier also. 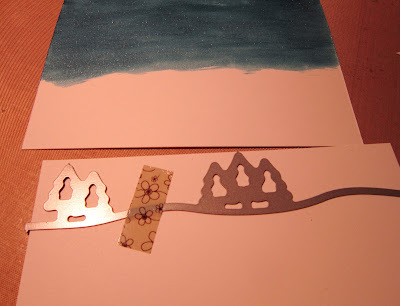 Then cut the hills and trees using the Elizabeth craft designs, Outdoor edges dies, as you can see I used the front of the die for the back pieces and the ones on the lower hill I just turned the die around and used the backside so the trees are a little more scattered. I added snow to my background and trees after I colored them with a white marker. I also added some snow gifted to me from a fellow cardmaker. Then I added the little bunnies from the Impression Obsession Rabbit set dies. They blended in a little touch much in the white snow so I cut them from gray card stock and added a little gray shading with ink. I hope you enjoyed my little scene today and have fun creating one of your own. I love your wintry scene Connie, a beautiful coloured sky! Great tip about reversing the tree die to change the layout too. Lovely coloring of your night sky and I like the trees on the fluffy snowy hills. What a fabulous winter scene you've created here Connie! Love that sky ... looks like snow is swirling around ... great job and awesome inspiration! What a sweet little winter scene you've created here Connie! Great job on coloring the night sky. Thanks for the helpful tip too on reversing the dies. I never think to do that!! Connie, love your winter scene. You did a great job creating it. gorgeous! 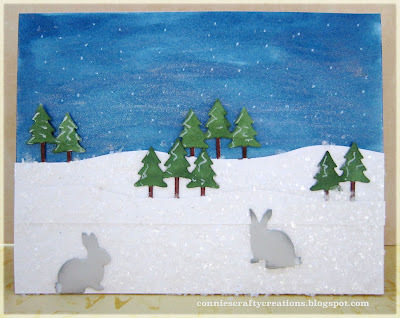 and the little rabbits are brilliant as a layer for your winter scene!